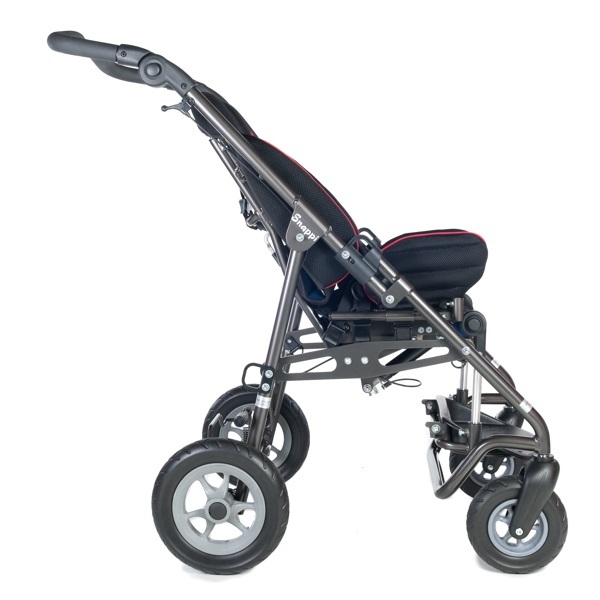 Gas Strut operated independent back recline without fixed positions. Slow release gas strut operated tilt-in-space which is without fixed positions. This allows a smooth transition to any position between 0 and 40 degrees. Snappi seat unit with quick-release interface. This interface has been specially designed to combine ease of use with enhanced saftey features. 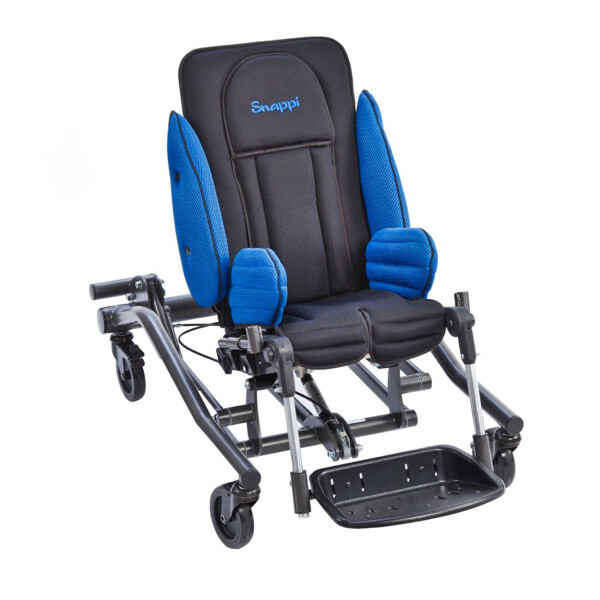 As such, the seat is easily-removable from either the indoor or outdoor chassis; features enhanced safety features to prevent the seat being fitted incorrectly; and is fitted with an additional safety locking catch prevents the seat from being accidently removed. 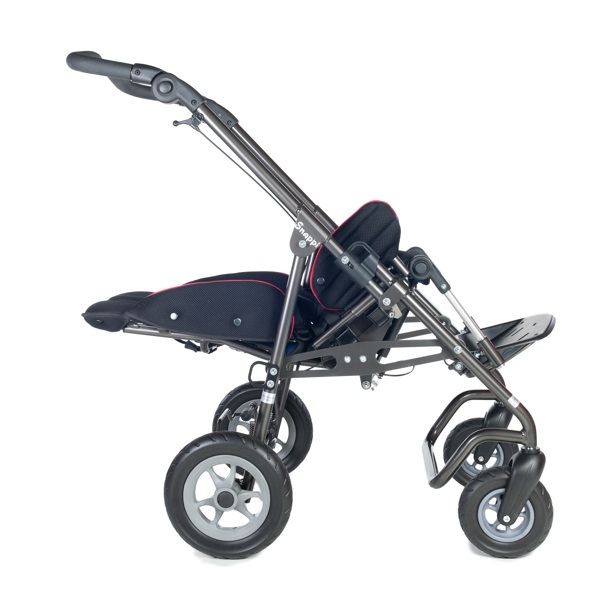 Adjustable hip width, depth and angle. Height and angle adjustable, flip-up footrest. Height adjustable, soft-grip push handle. Soft-touch, pin lock brake which is both quiet to operate and easy to use. A choice of 7 different colour fabrics (black fabric with either lime green, blue, red, magenta, grey side wings, hip guide covers and embroidery or black fabric with red or pink piping and embroidery). You can view photos of each option under the material choice section and washing tab or by clicking here. Transit Tie-down system (fitted) which enables the Snappi to be transported in a wheelchair-adapted vehicle. Snappi Seat Minimiser Upgrade Kit For Size 1 Snappis Only (SN9307) - kit includes a 2" covered foot pad, 1" seat pad, 2" longer side wings to accomodate back pad, 2" back pad and bespoke back and side wing covers. The minimser is available either at the point of manufacture, when it will be fitted by us, or it can be retro-fitted by a technician. Push Handle Mounted Attendant Brakes - Hub Brake Wheels (SN6259) Please note these are only available at the point of manufacture and the standard foot operated brake will be removed when this option is chosen. Equipment Carrying Tray - Size 1 (SN7306). Please note that the maximum internal width is 365mm and the maximum internal length is 415mm. Equipment Carrying Tray - Size 2 (SN7328). Please note that the maximum internal width is 438mm and the maximum internal length is 430mm. Vertical Cylinder Carrier - Size 1 & 2 (TSS02). Suitable for use with maximum cylinder size of BOC CD or equivalent. 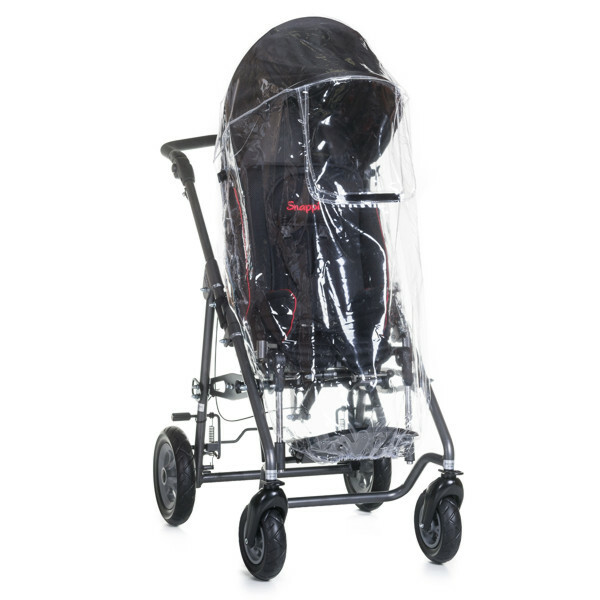 Buggy Pod - click the link below for information www.buggypod.com Please ensure you check suitability and stability.